A center for space weather has been established in Azerbaijan and the solar telescopes at Shamakhi Astrophysical Observatory have been upgraded. Azerbaijan’s National Academy of Sciences announced the news at an International Conference for Solar and Spatial Weather Researches underway in Baku from July 6 to 8. The international conference entitled Variability of the and Sun-like Stars: From Asteroseismology to Space Weather is sponsored by a grant from the Science Development Foundation under the President of Azerbaijan with organizational support from ANAS. The executive director of Science Development Foundation, Elchin Babayev, addressing the event discussed the Foundation’s events and activities. He said that the rapid development of space technology has resulted in significant changes and new perspectives in the field of solar physics. It was noted that Azerbaijani scientists, who conduct intensive research into the influence of solar activity and space weather in recent years, have established a close cooperation with colleagues from a number of countries around the world. Local scientists are being increasingly published in international journals. The conference will present a number of important reports on helioseismology and asteroseismology using special theoretical and experimental methods to investigate inside layers of the sun. Some reports will be devoted to the influence of solar activity on the Earth’s climate and some on the effect of technological systems on the health of human beings. Speaking about significant achievements in several areas, including the development of science, Babayev noted that the main aim is to turn Azerbaijan into the largest research center in the region. The head of the Shamakhi Astrophysical Observatory and a member of ANAS, Namig Jalilov, spoke about the research conducted in the field of solar physics in recent years in Azerbaijan and around the world, and noted their importance. The conference gathered scientists from Denmark, France, Germany, the U.S., Russia, Ukraine, Israel, Bulgaria, England, Uzbekistan and Georgia, who will deliver reports reflecting the latest innovations in the sphere of solar physics and connections between the Earth and the Sun. Scientists from various organizations in Azerbaijan will deliver reports on their research as well. 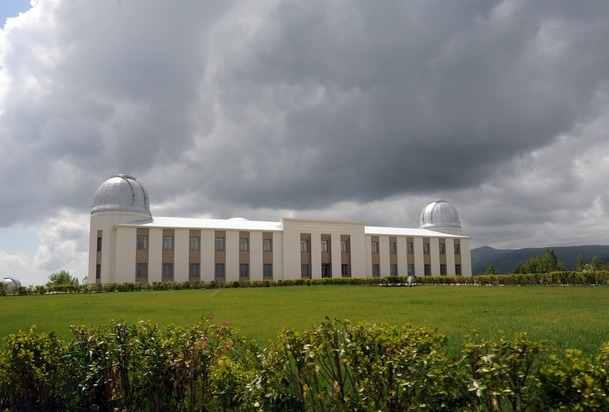 One of the sessions of the two-day conference will be held in Shamakhi Astrophysical Observatory. Here, besides scientific reports, the issues on further cooperation will be discussed. The new Space Weather Center was constructed at the site of the Shamakhi Astrophysical Observatory, and it will be commissioned before the end of this year. It will be equipped with antennas, receiving devices, magnetometers, and other state-of-the-art scientific equipment. The center will play an important role in scientific research in the field of space weather, tracking processes occurring on the Sun, and keep track of the effects of geomagnetic storms in real-time and so on. Azerbaijan began to monitor the Sun in the last 10-15 years. A school has been established in this field. Azerbaijan entered the space club with the launch of its first satellite Azerspace-1 in February 2013. As of now, the country has three satellites, one used for telecommunications and two low orbit satellites, and it plans to launch a second telecommunication satellite in 2017.